O'Reilly discovered that the machine named Stencil-Pen by Thomas Edison had the possibility to ink under the skin after a conversion they had. For the first time in 1891, he patented an electric tattoo machine,called Tattoo Gun. O`Reilly had his own tattoo shop at Chatham Square in New York City. 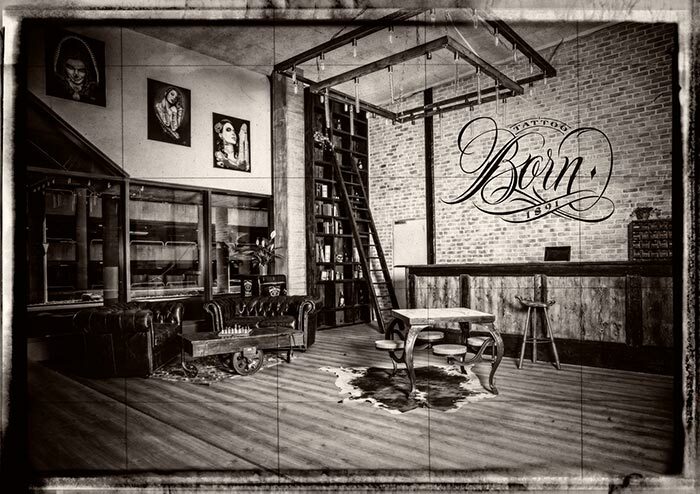 Born1891 delight Zurich with the best tattoo artists resident and the elite tattoo artists from around the world. The studio is one of the largest in Zurich and offers from Fine lines to the royal class Realistic the whole style palette are available. The customer is a king and will be treated like. Here we do not know you by numbers, every guest belongs to the Born Family. We look after you from first day until you get your tattoo done. Sketches are drawn by us. Portraits can be professionally scanned here. Only when the customer is satisfied he will be tattooed. Hygiene is written here in CAPITAL LETERS! Our artists work professionally and using EU standard certified materials. Our artists are not only the best in they fields, but also great with design motives all according to your ideas - until you are satisfied! "Professionelles Team und die Arbeiten unglaublich. Fühl mich hier zu Hause." "Das erste Studio das nichts zu wünschen übrig lässt. Sogar Dolmetscher für die Gast Tätowierer aus Spanien sind anwesend"